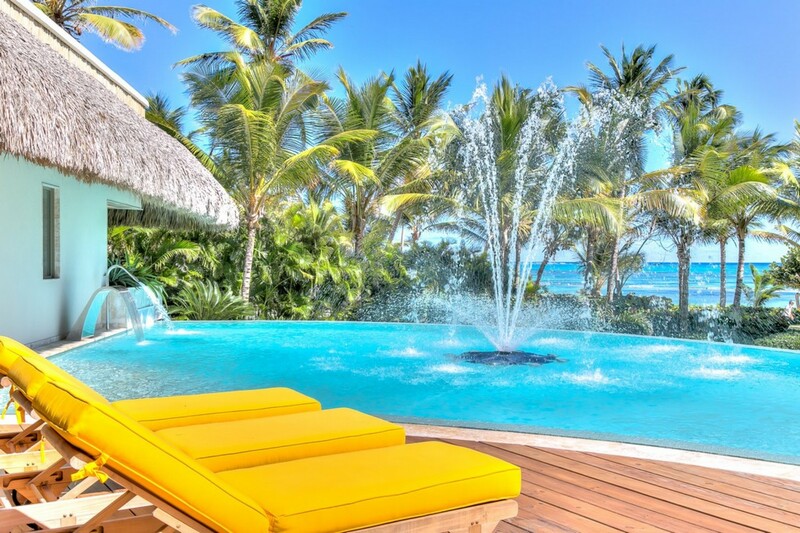 Welcome to Sirena Blue, an amazing 6-bedroom luxury beachfront villa located exclusive gated community of Punta Cana Resort & Club, in the Dominican Republic. 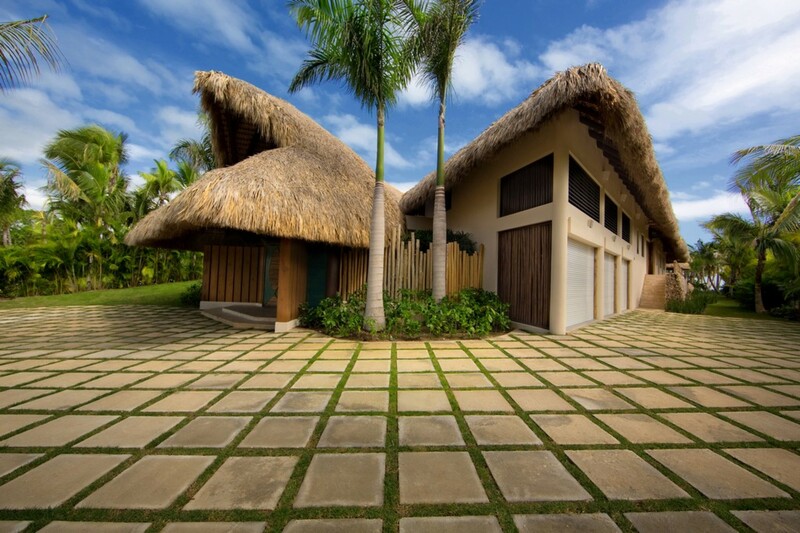 This exquisite and secluded property gives you an abundance of both interior and exterior living spaces. 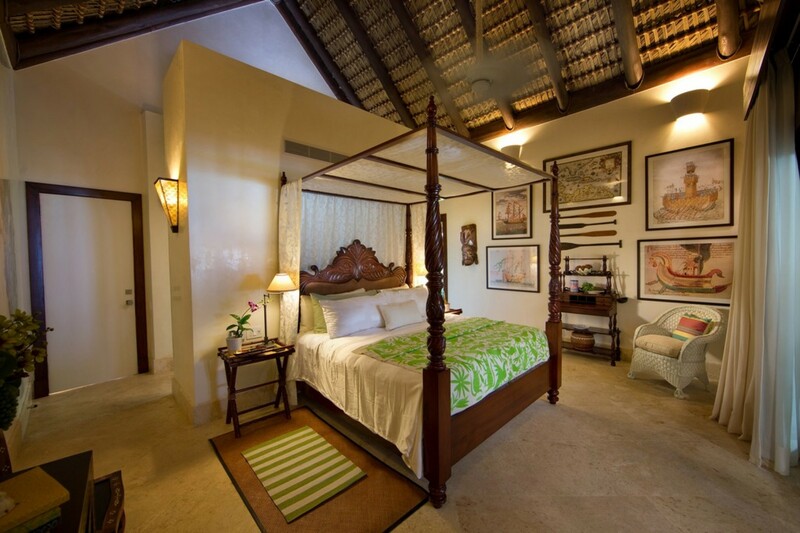 Villa Sirena Blue can accommodate up to fourteen guests across its luxurious bedrooms and expansive rooms. 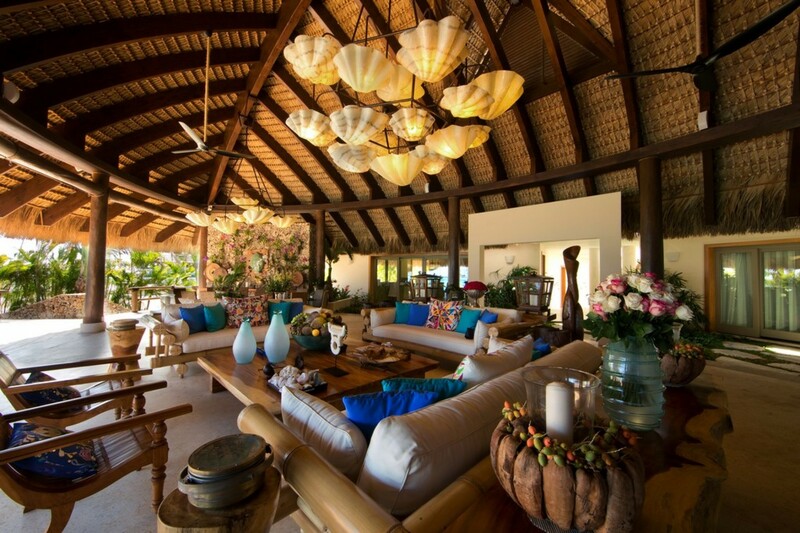 It is an exceptional villa that will provide you with a truly authentic holiday experience. 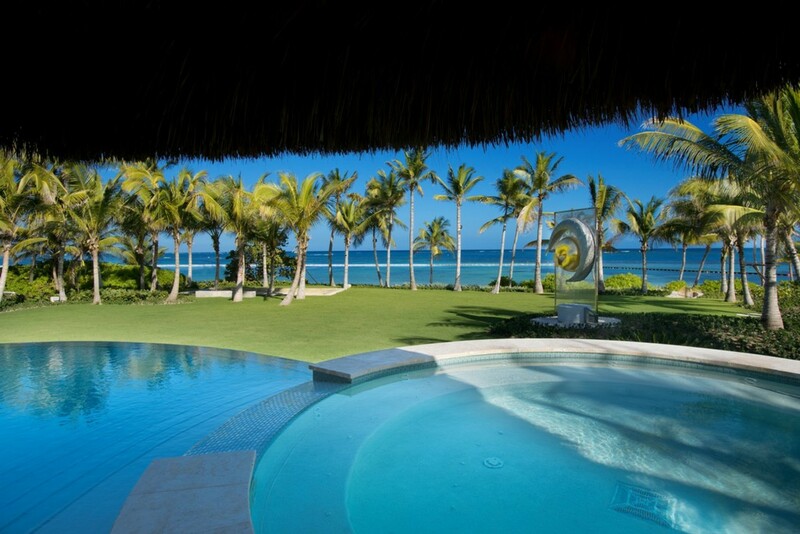 Formed by architect Antonio Imbert and interior designer Patricia Reid this villa reflects all the world of travel. 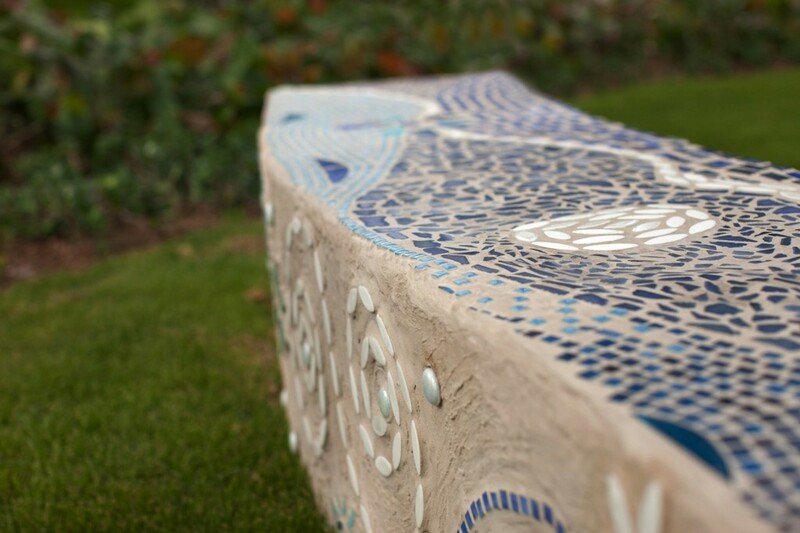 It is a peaceful home where you can breathe in the incredibly cultural pieces brought from all corners of the world. 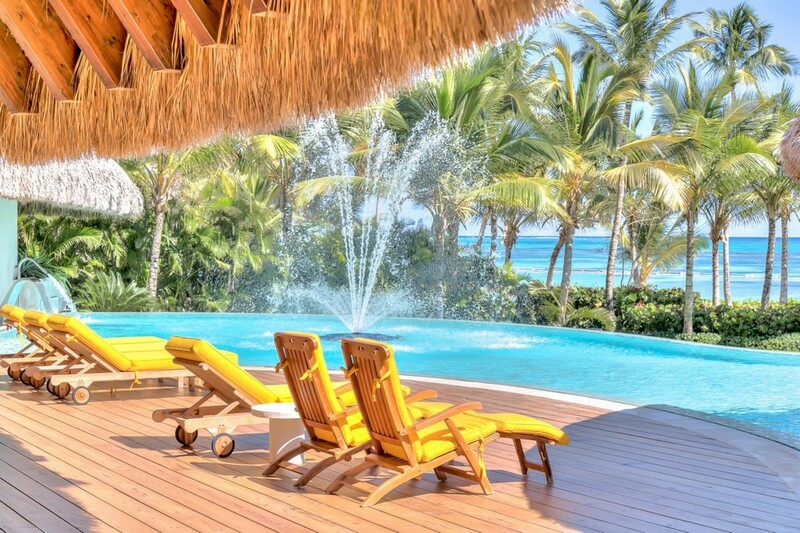 The villa is perched on the sugar-fine sandy beachfront in Punta Cana’s most exclusive Resort. You can spend a day out on the powdery sands and sunbathe if you wish or dive into the crystal-clear blue waters for a swim. Why not walk along the shore and let the water lap onto your toes as you go shell hunting. 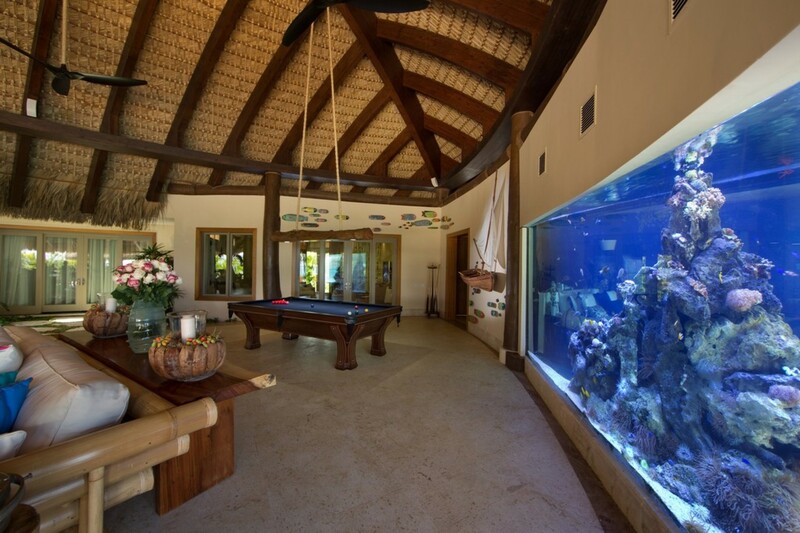 You can also go snorkelling to see if you can spot any tropical fish. 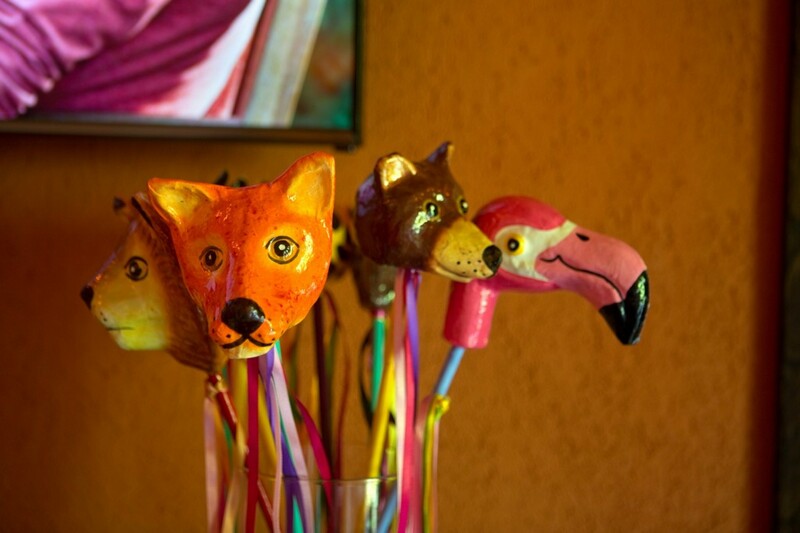 Visit the resorts bars and delicious restaurants in the evenings for some tantalizing treats during your stay. There are loads of places to explore here in the surrounding property. 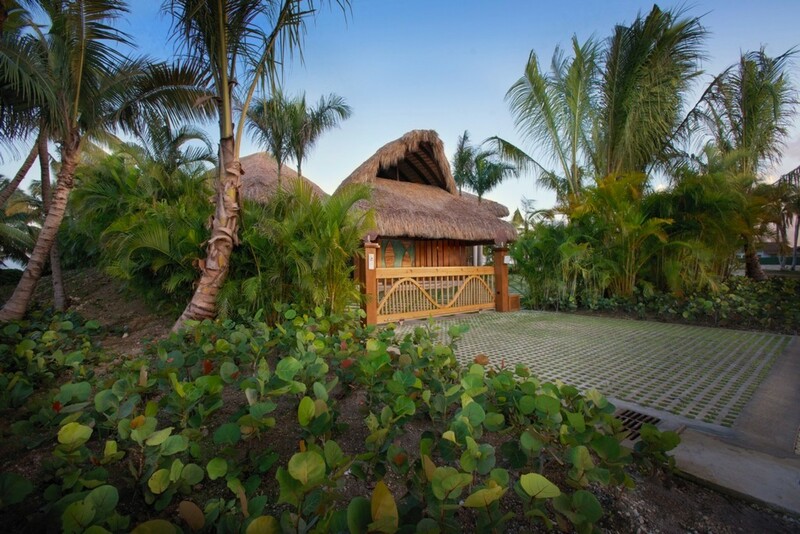 The Ojos Indigenas Ecological Park is a short drive on your rented golf cart as well as the crystal-clear fresh water of the lagoons nearby. 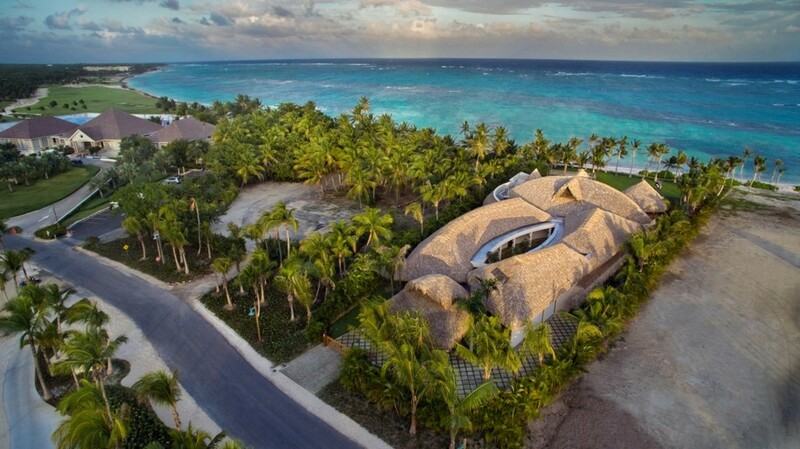 This palm tree-lined villa glistens with elegance. 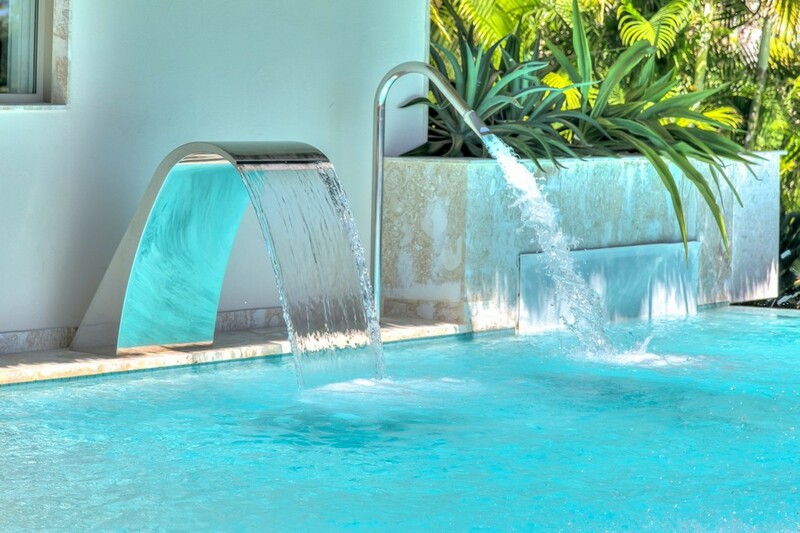 The large swimming pool sits at epi-centre with its indulgent Pool Massage Jets and fountain as well as having an integrated pool bar and in water seating. 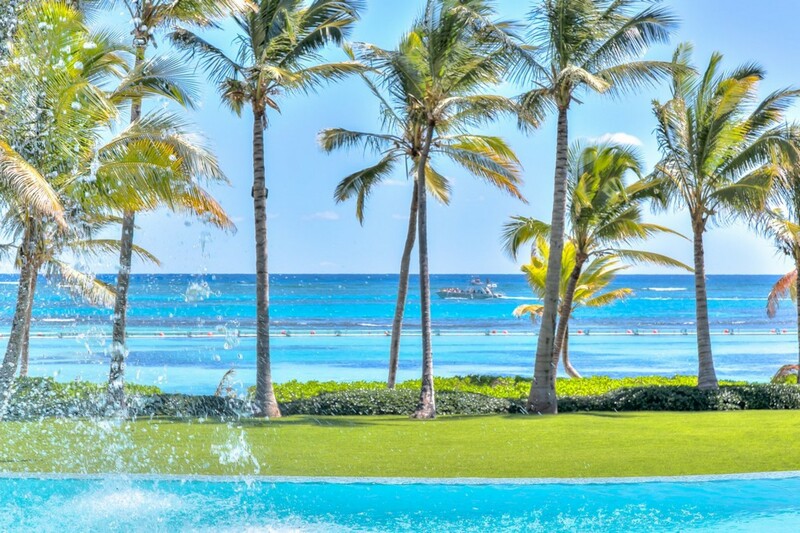 The crystal-clear turquoise waters of the pool are perfect to slip into for a refreshing morning swim or dive into the refreshing waters to cool down after some sunbathing. The landscaped gardens surrounding your secluded villa are breath-taking as the villa is built in an area of lush tropical plants. The vivacious vegetation makes the land burst with a palette of vibrant colours and the tranquil pool is embedded at its core. 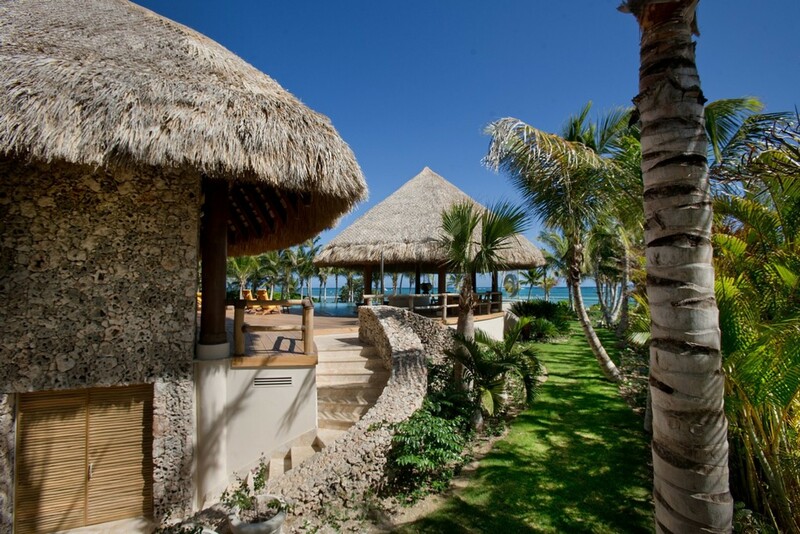 Relax out on the comfortable sun loungers or seek some secluded shade in the private Gazebo built with a traditional thatched roof. 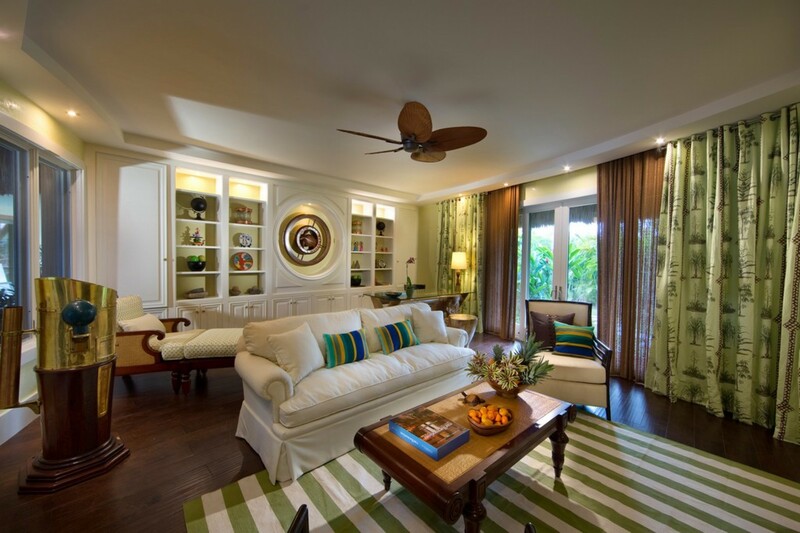 This authentic space is perfect to read your favourite book as you let the cool Caribbean breezes skim across your skin. 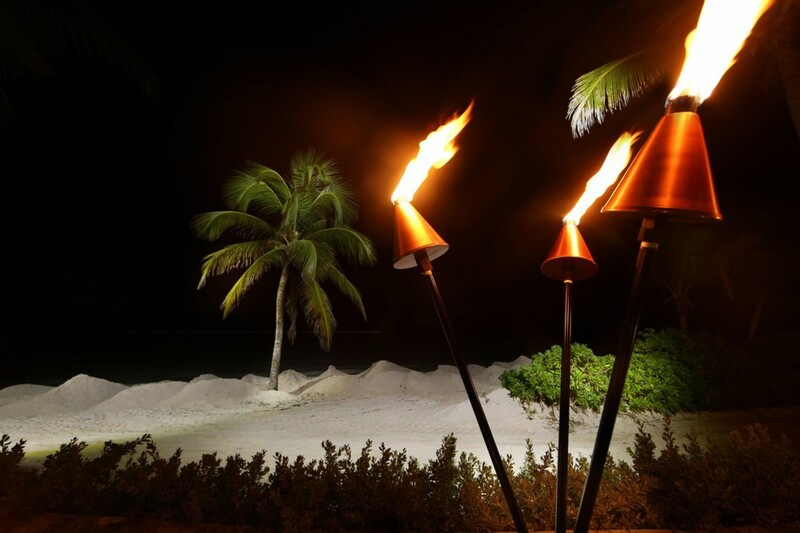 Let yourself relax into the rhythmic swaying of the tall palm trees as you let your worries melt away. The Gazebo includes an alfresco covered dining area ready for you to indulge in an alfresco meal surrounded by your loved ones. 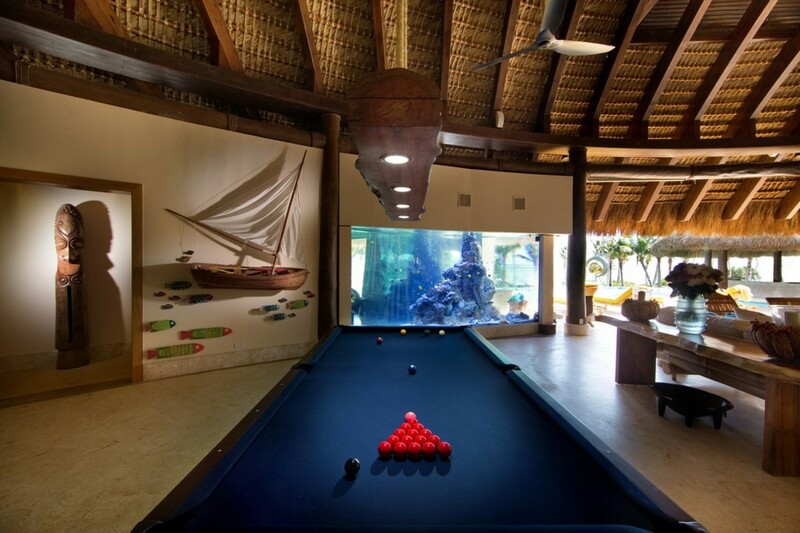 The space is complete with authentic nautical pieces. 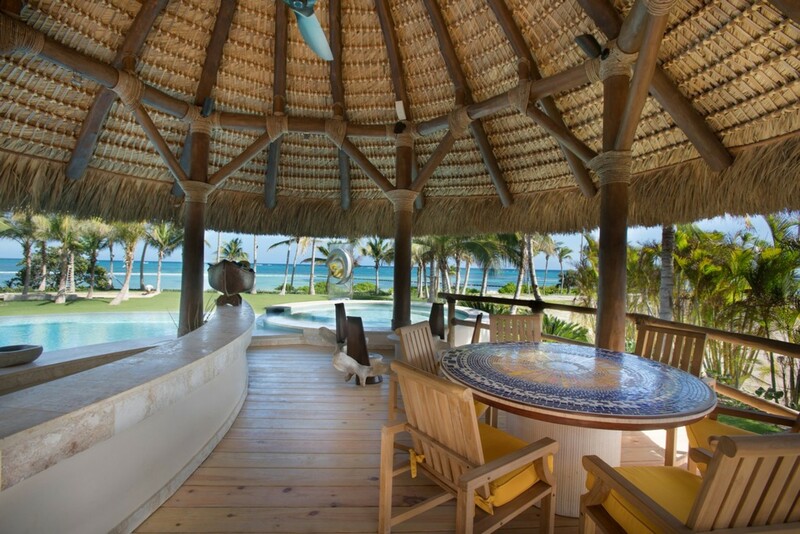 It is the perfect place to sip on a cocktail from a coconut from your fully stocked bar and look out over the manicured lawn, and over the glistening ocean. Watch the boats sail by and the sunset making the sky fade from golden to a warm pink. 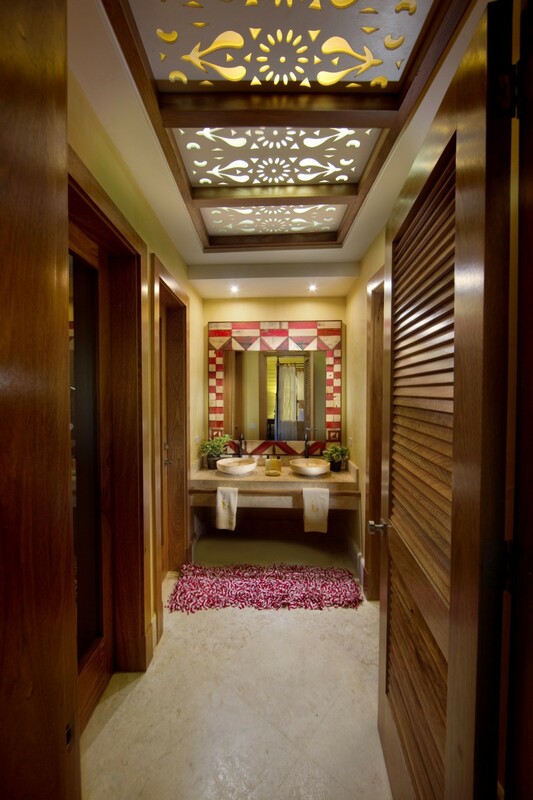 What else is there to do them enjoy this tranquil ambiance and relax in your serene villa. 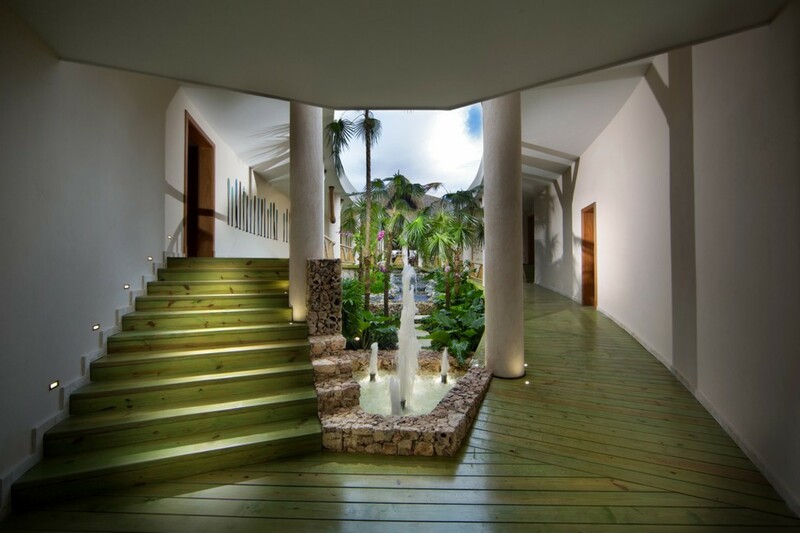 Walking into the main entrance of Sirena Blue, you will immediately find yourself in an authentic and vibrant villa. 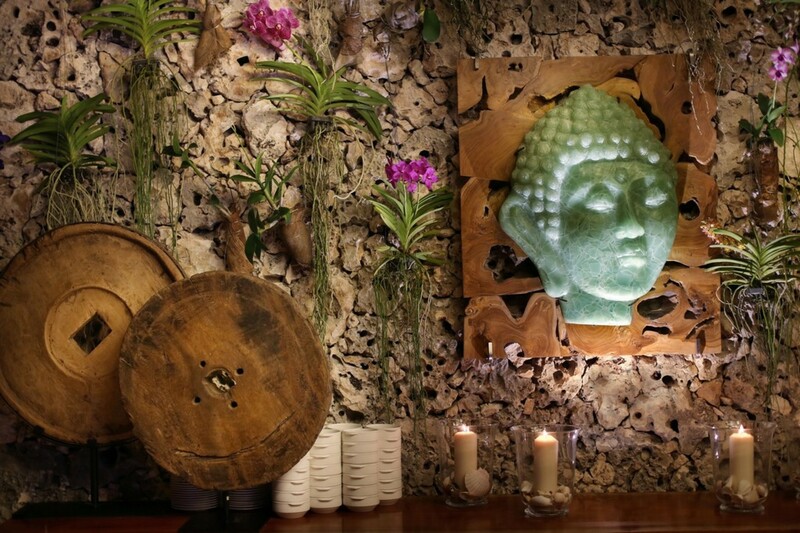 The polished pastel green wooden floors and the traditional wooden masks and artwork laces the hall and brings you into the blended indoor/outdoor garden area. 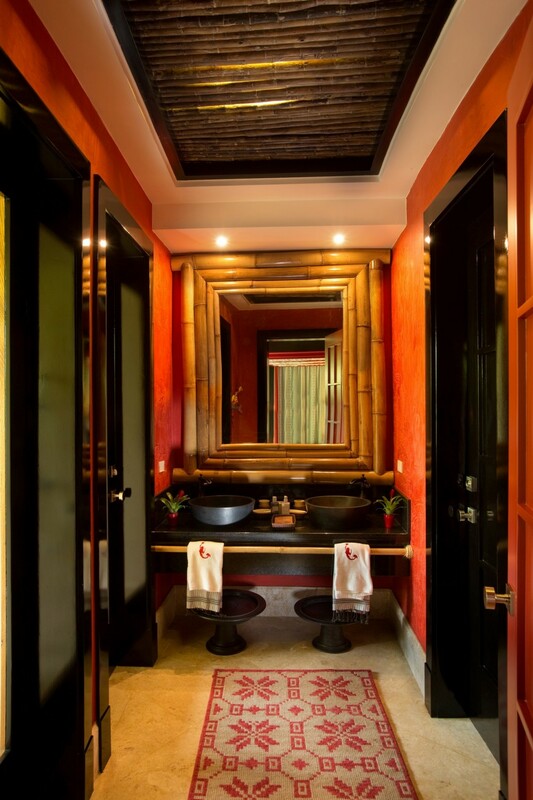 The ceiling opens up allowing the tall palm trees to grow through the centre of your private villa and allows the cool breezes into the halls and spacious rooms. 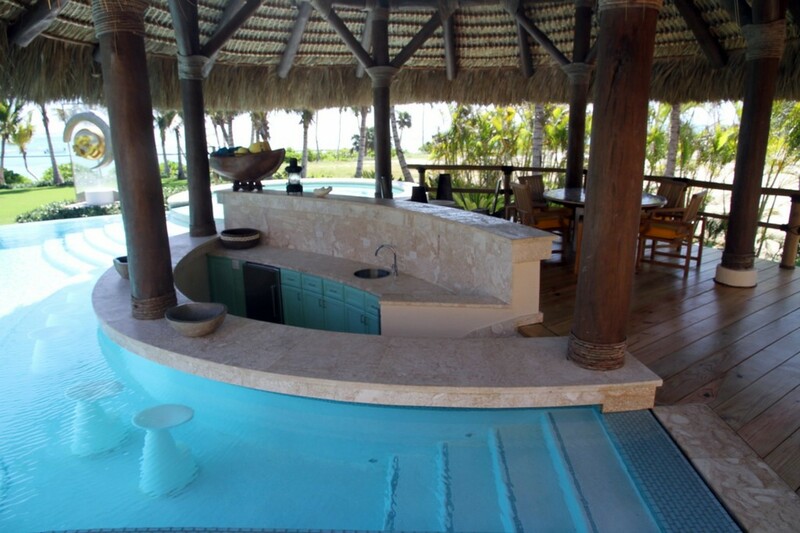 The water fountain in the centre creates a tranquil ambiance as the sounds of waters echo through the villa. 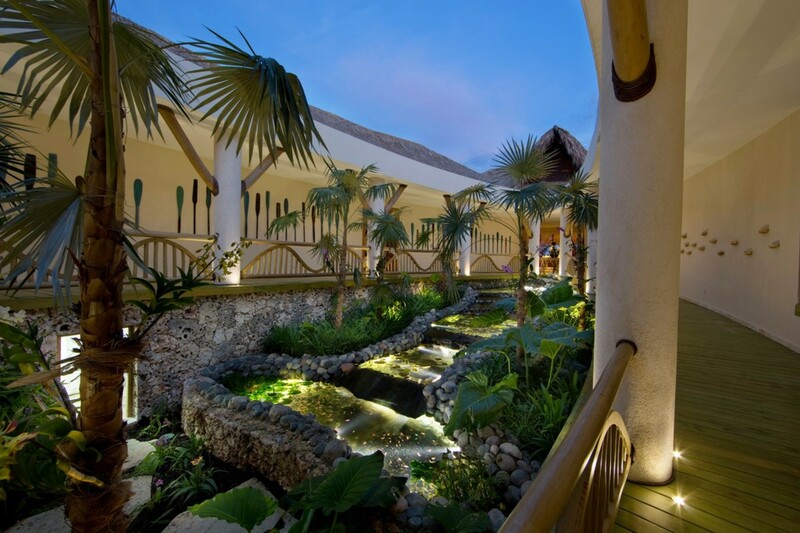 The indoor garden is laced with vivacious tropical plants and is finished with a tiered pond. The hallway will lead you into the kitchen where the continuation of the calming green pastel colours is laced through the room. The large marbleized counter sits in the centre of the room and is dotted with vibrantly painted stools. 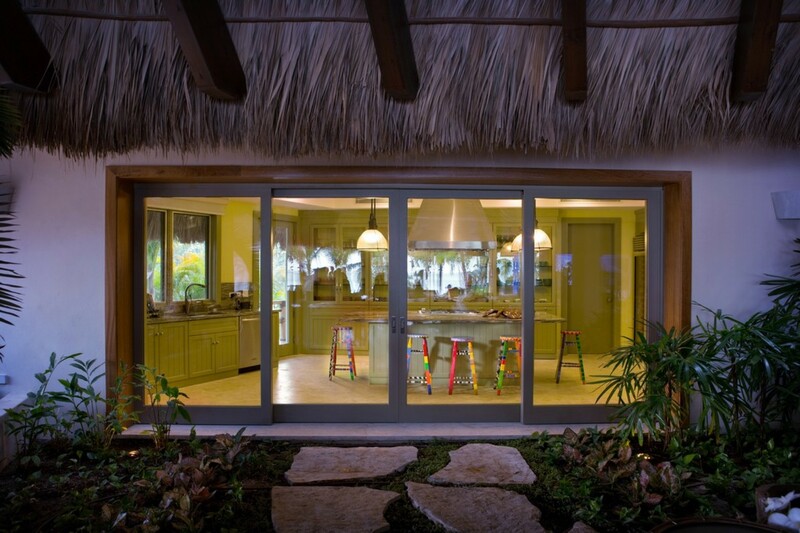 The overall kitchen comes fully equipped and ready to use. 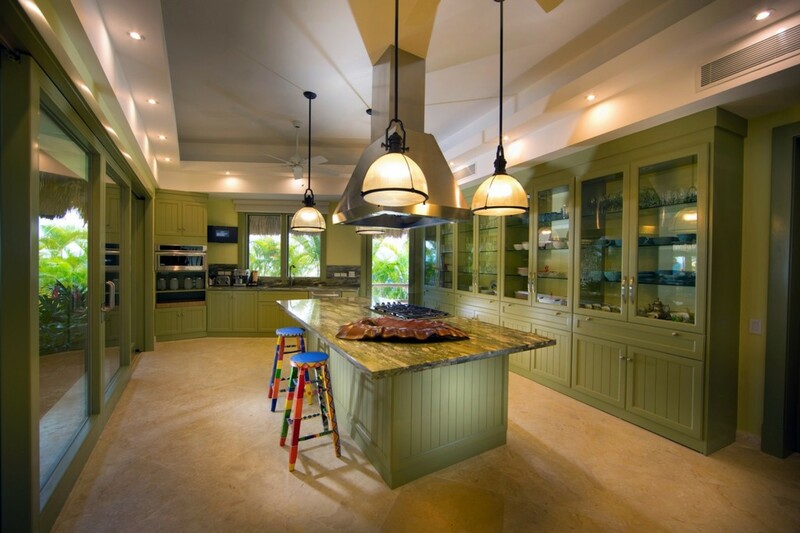 Your professional chef can prepare tantalizing treats and delicious meals here for you to enjoy. 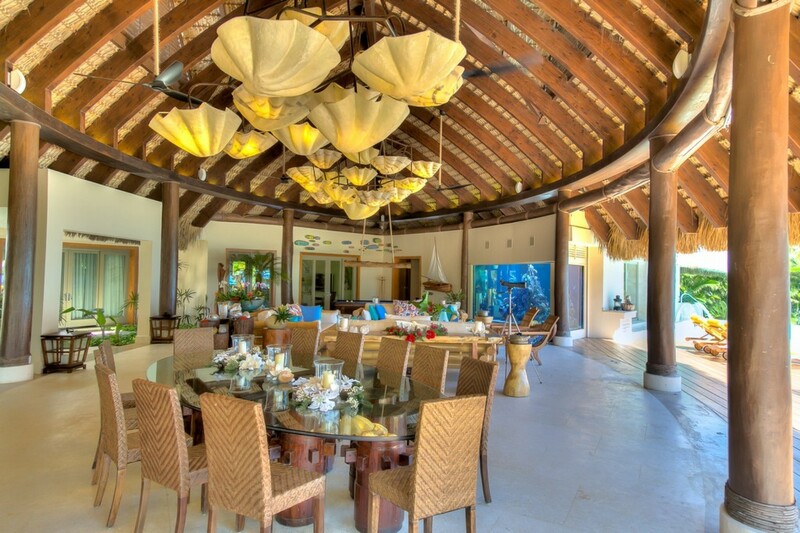 The large living and dining area overlooks the incredible panoramic ocean views and is fitted with plush seating, cushions and embroideries, large aquariums, a pool table, and an abundance of space. 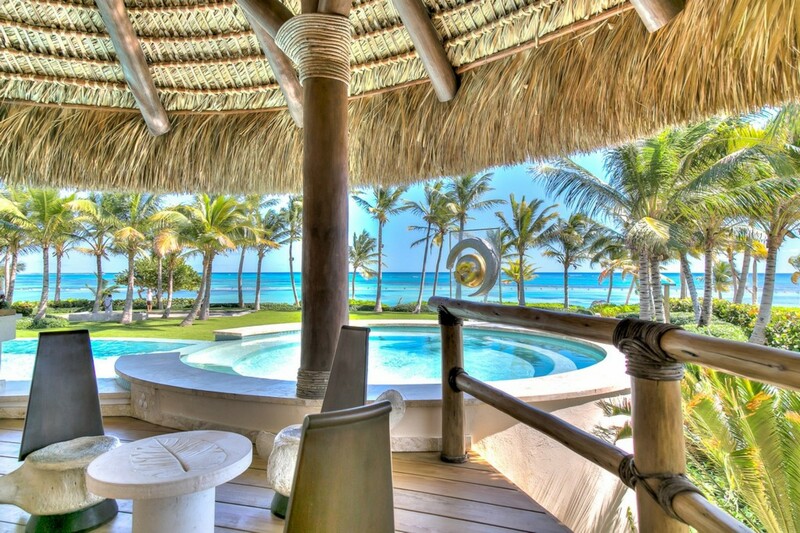 The room is fitted with high-rise thatched ceilings and has direct access out onto the private terrace and landscaped gardens. The dining table can seat up to twelve guests over the large clear-cut glass table. 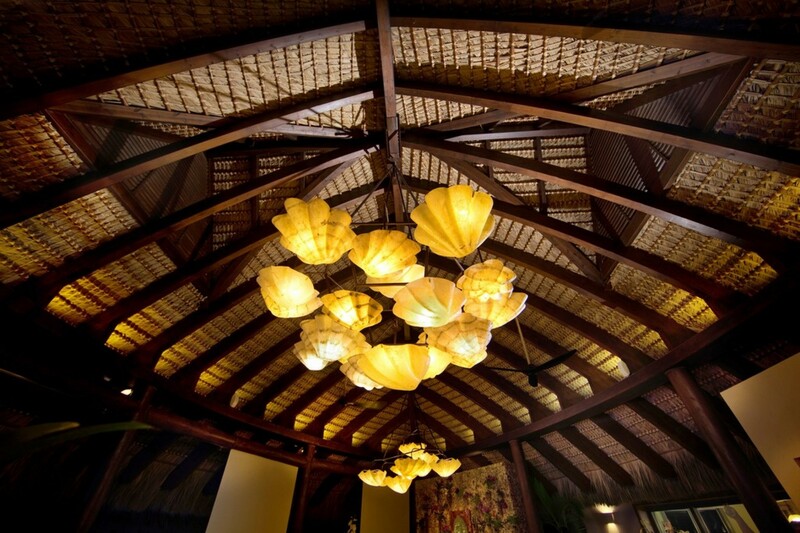 Look up and see the shell-like lights that decorate the room. 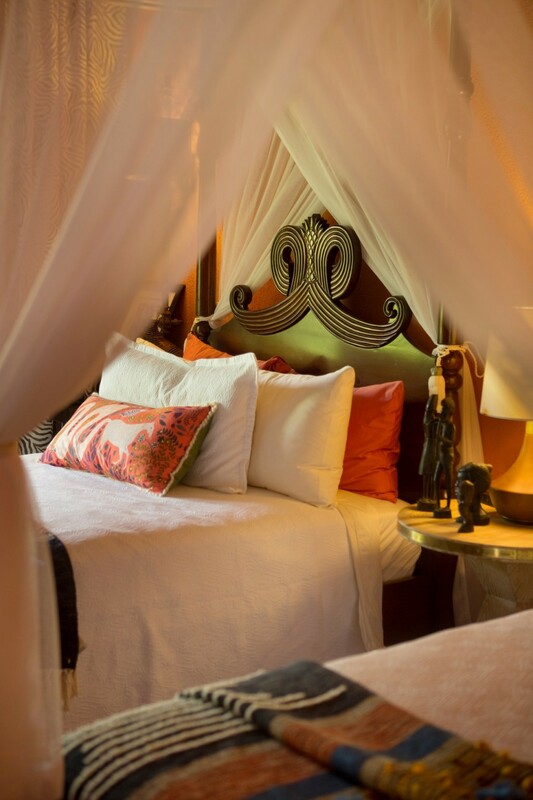 Delving into the details of the luxurious bedrooms, there are six in total including the Aquarium Master Suite, Colonial Bedroom, Asia Bedroom, Africa Bedroom, Dominican Bedroom and the Staff Bedroom. 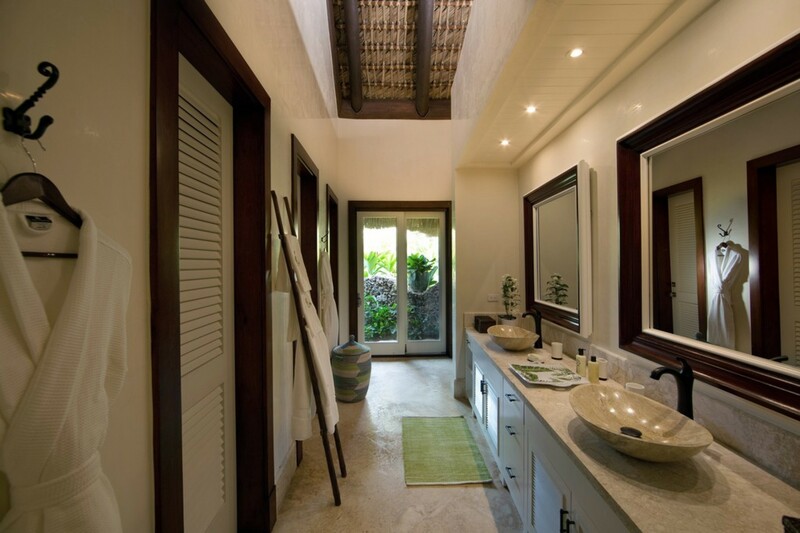 Each of the bedrooms have their own private en-suite bathrooms. 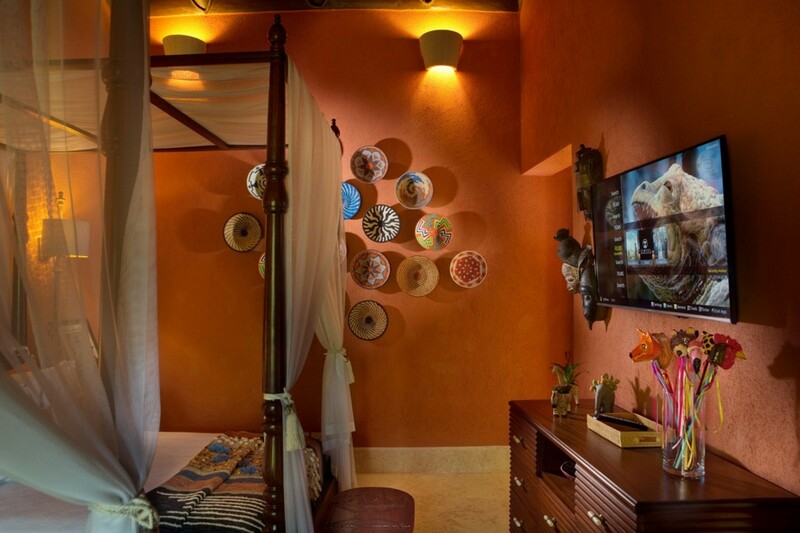 All bedrooms excluding the staff bedroom has open air exterior roofed showers overlooking the gardens, a high-resolution TV with a library with over 200 movies and a safety deposit box. 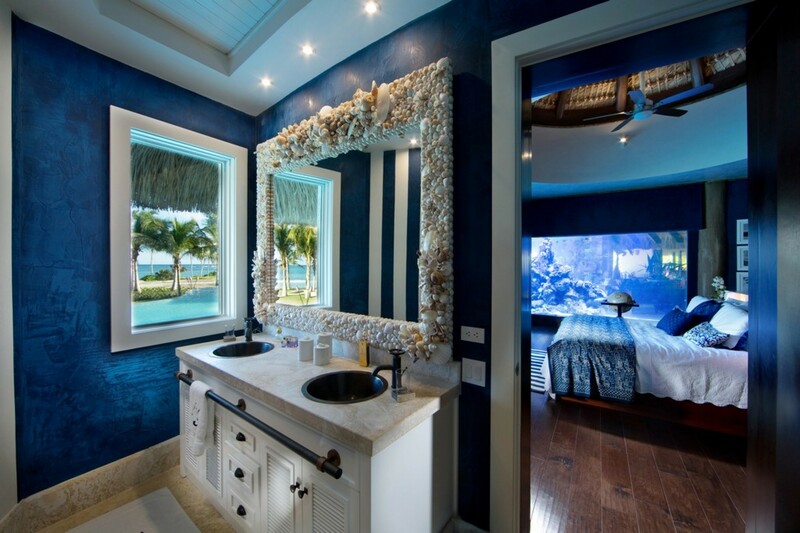 The Aquarium Master Suite, Dominican and Colonial Bedrooms have luxurious King-sized beds. 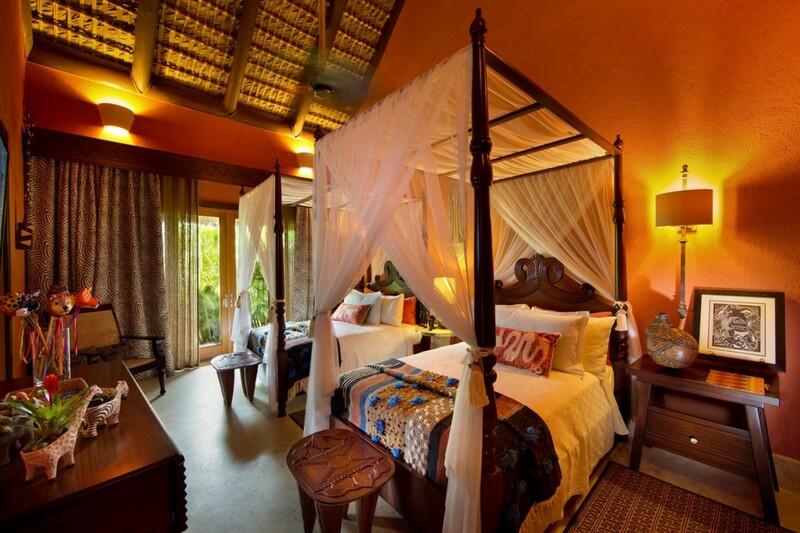 The Asia and Africa Bedrooms have two comfortable full beds each. The staff bedroom has a comfortable sofa bed. 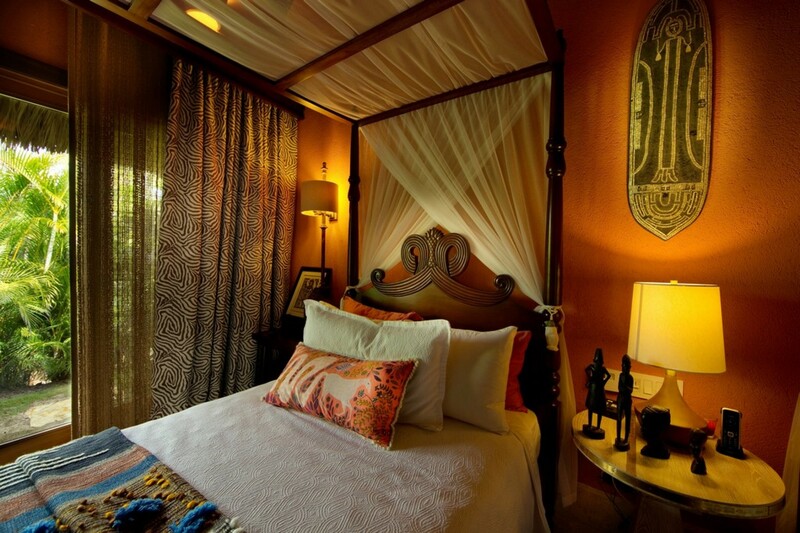 Each bedroom follows a unique and distinctive decoration based on a different topic or culture. 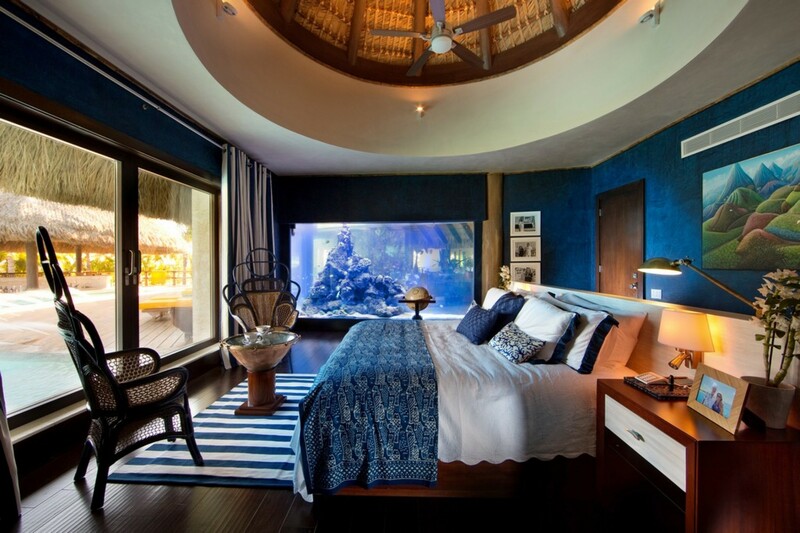 In the middle of the master bedroom, there is a giant fishbowl with corals and saltwater fish. 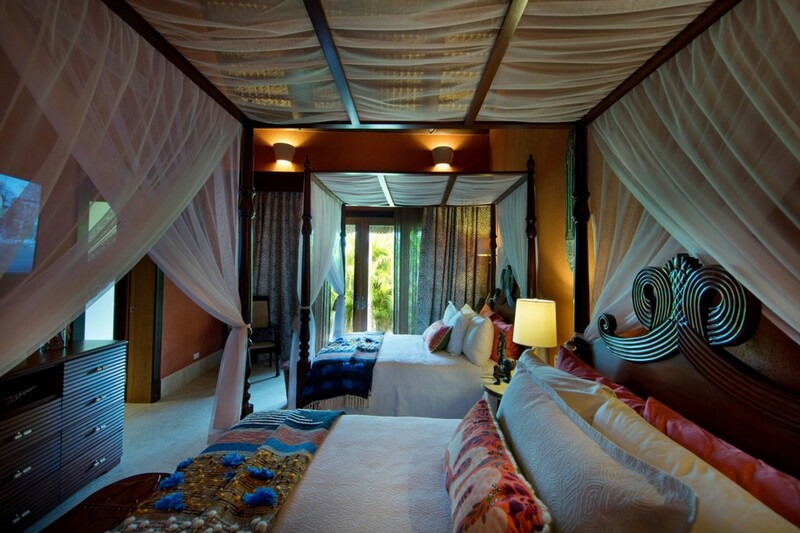 One of the bedrooms are dedicated to the owner’s trips to Asia, which they. 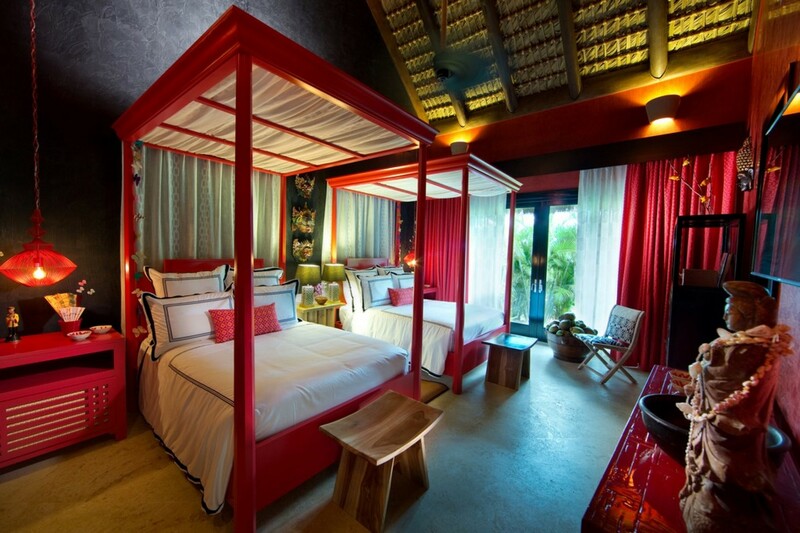 The beds are very modern with straight lines and lacquered in red. The dramatism is highlighted by the original colourful masks and an ancient door unfolds like art. 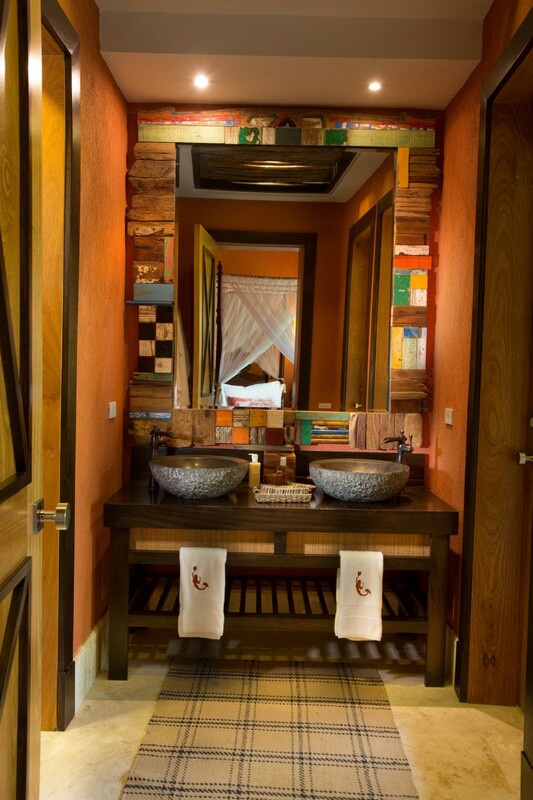 There is a thick mirror frame made of bamboo and Teka banquettes that make the room bust which a unique character. 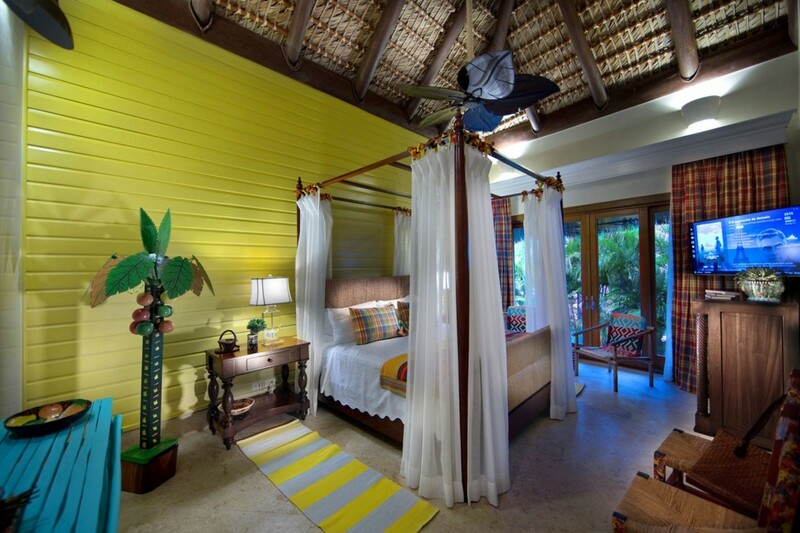 In the Dominican Suite the room is laced in beautiful local craftworks and decorated with hand painted chairs. 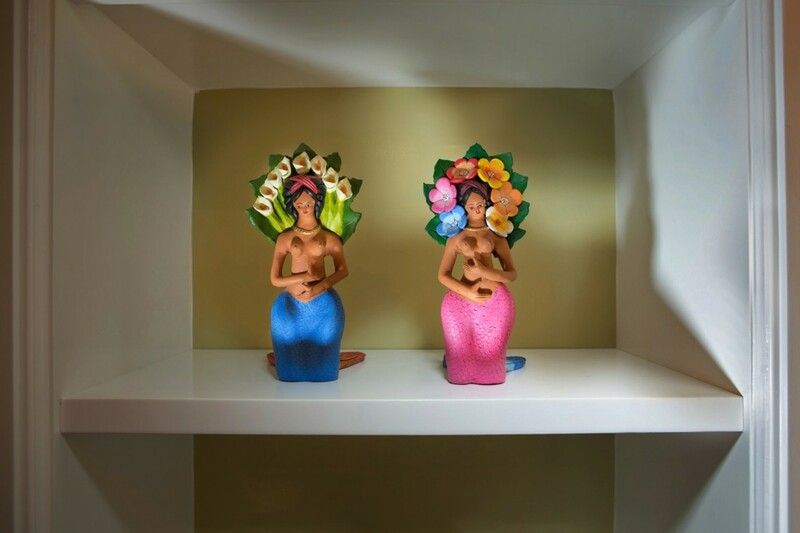 It is splashed in colours due to the Caribbean collectible paintings such as La Virgen de la Altagracia. 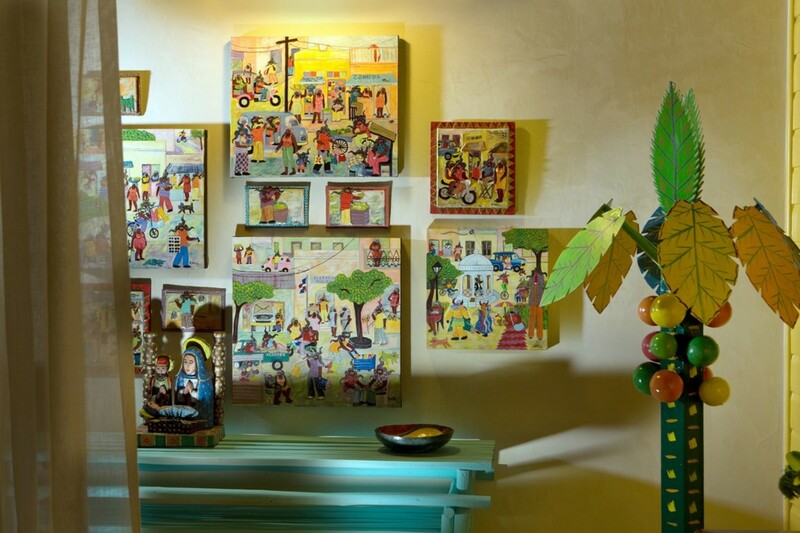 his bedroom has the typical “criollo” style. 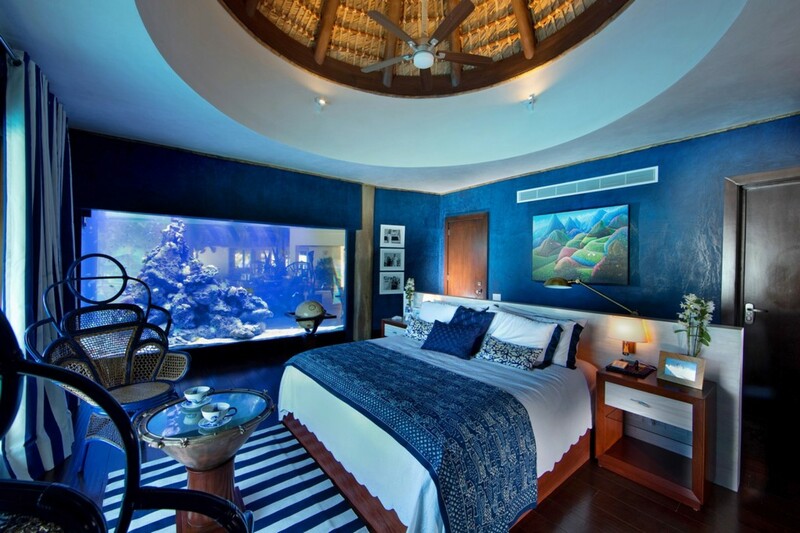 Aquarium Master Suite: : Luxurious King-sized bed, Private En-suite bathroom, Open air exterior roofed shower overlooking the gardens, Armored Safety room, High-resolution Television, Library with over 200 movies, access to IP-TV, safety deposit box. 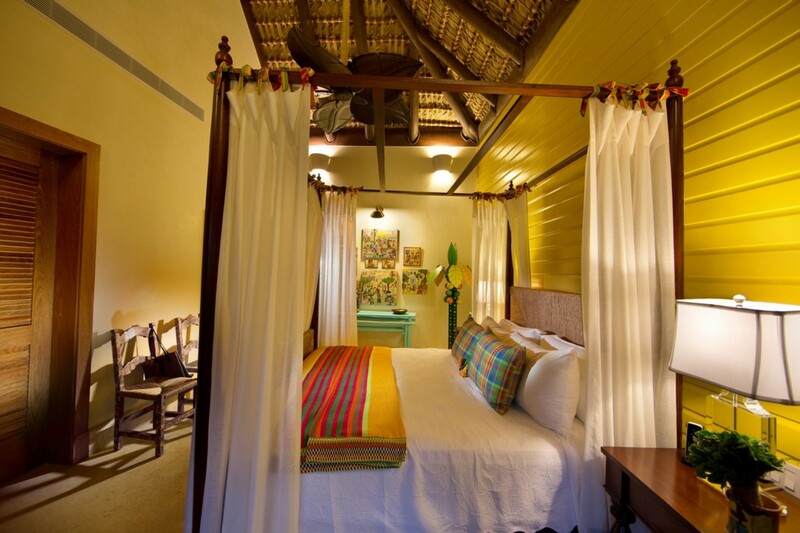 Staff Bedroom: Comfortable Sofa Bed (for driver/babysitter or personal guest/staff), Private en-suite bathroom, Shower. 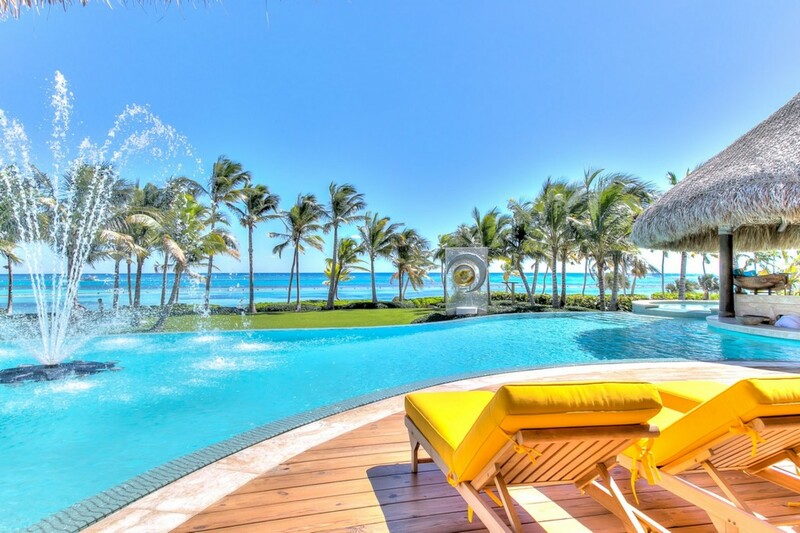 Sirena Blue is nestled in the vibrant and exclusive gated community of Punta Cana Resort & Club, in the Dominican Republic. 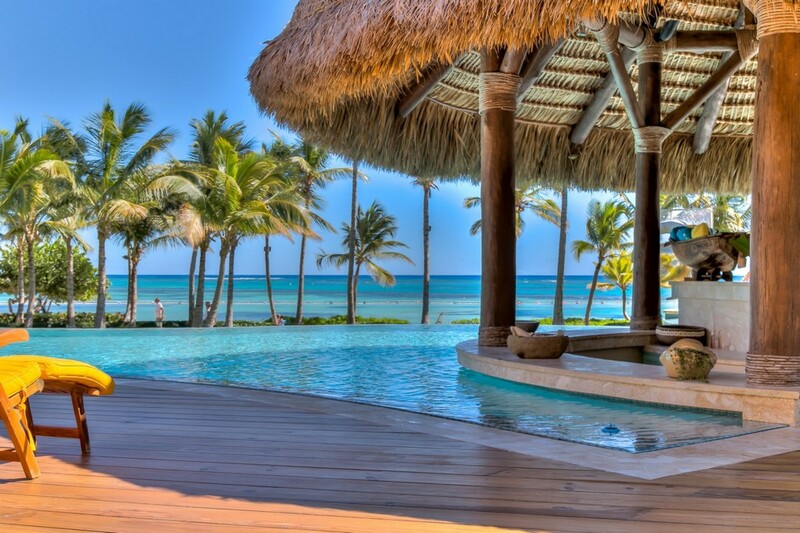 Punta Cana Resort & Club is a 26-square mile paradise. The climate includes occasional light rainfall and soft breezes keeping the temperature at a very comfortable level. 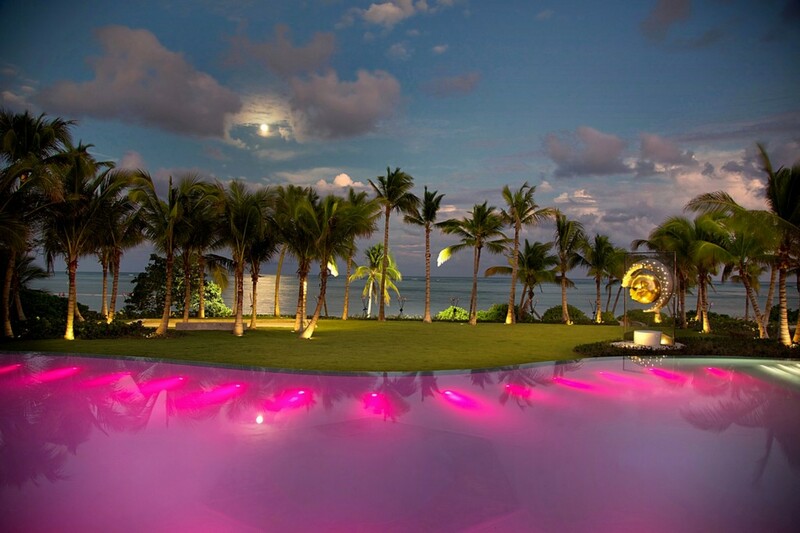 It's colorful coral reefs, tranquil crystalline waters and white sugar-fine sandy beaches are breathtaking. 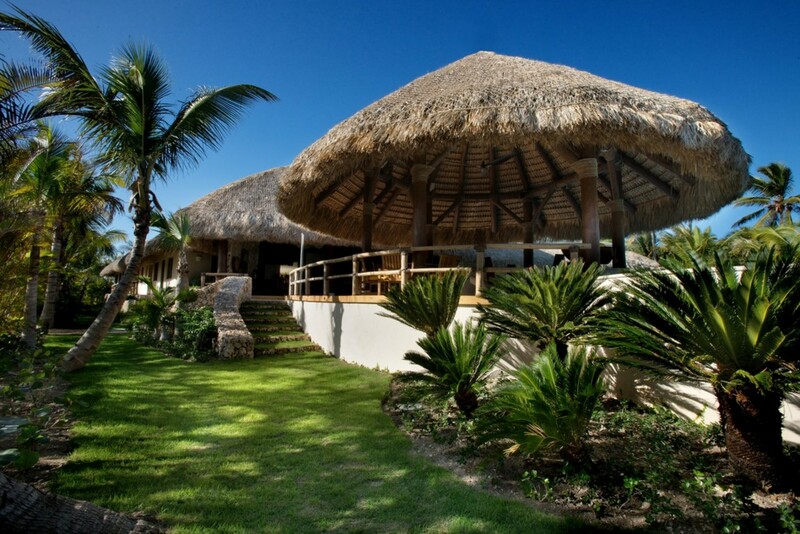 The Resort provides a tropical lifestyle as well as high standards of quality, comfort, and aesthetics. 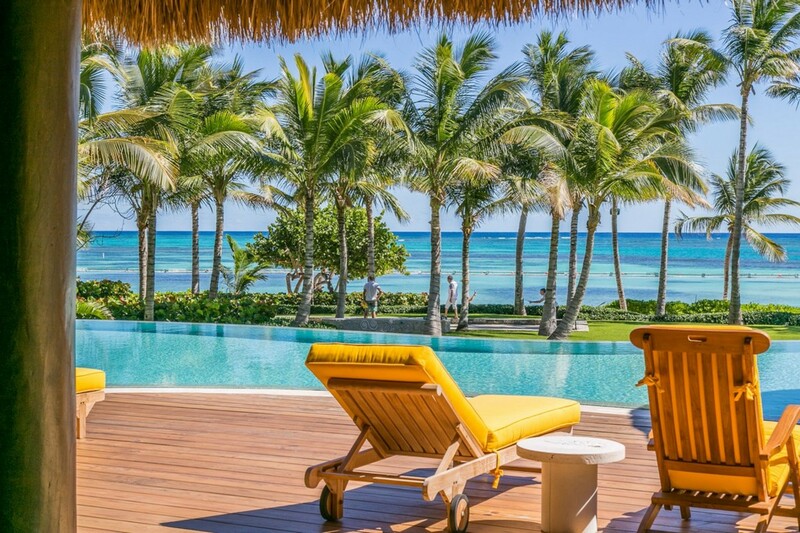 Sirena Blue is based close to the International Airport of Punta Cana as it is only a short fifteen minutes’ drive at 10 km in distance. 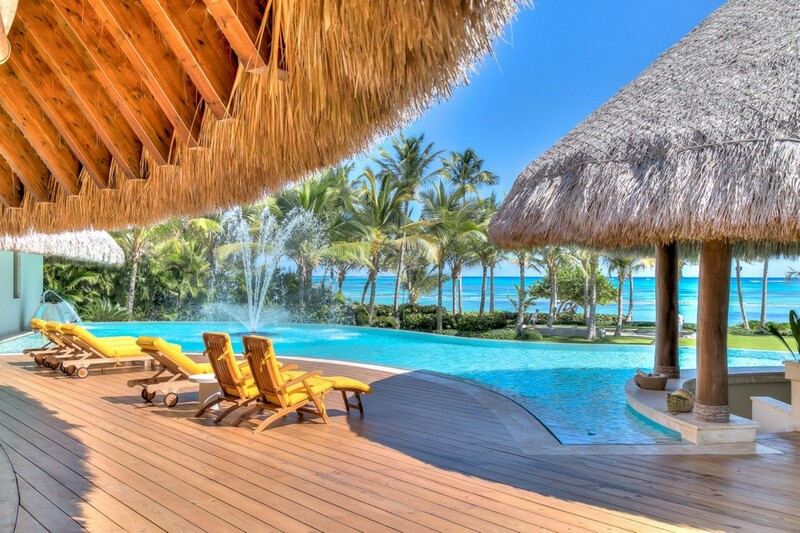 The Dominican Republic is the second largest and most diverse Caribbean country. 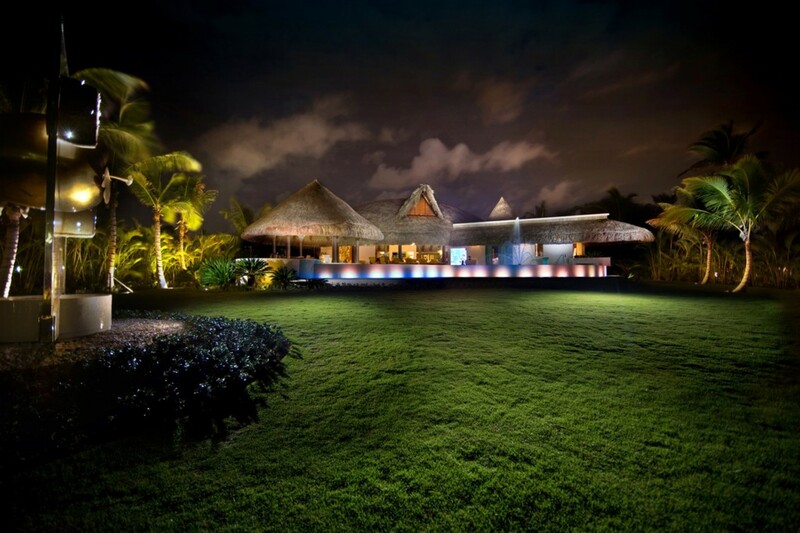 It is renowned for its comfortable climate and vivacious tropical vegetation. The intriguing history that this location provides is rich in traditional culture. 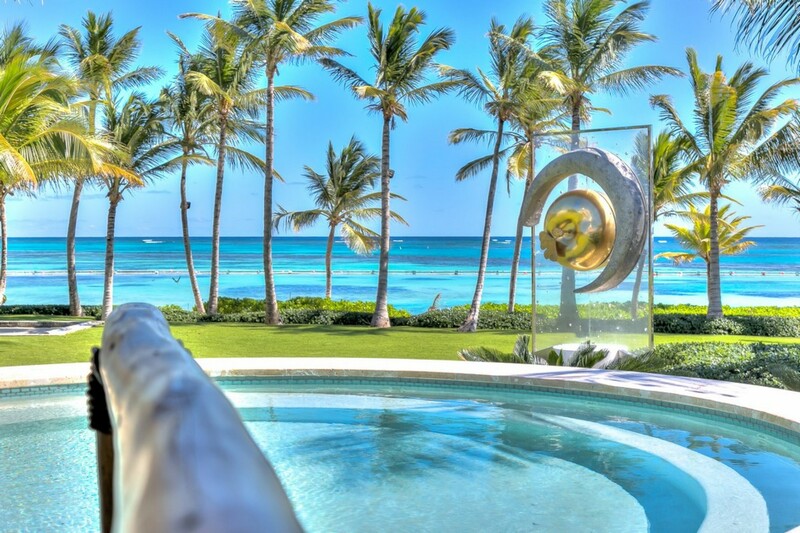 Surrounded by the Atlantic Ocean on the north and the Caribbean Sea on the south, this enchanting island has 250 miles of world-famous beaches, with white sugar-fine sand and clear crystal waters.